This little commission was done for a request of John & Sherlock playing with my kitties, so Belladonna (left) and Pteropodidae (right) go to take a little trip to Baker Street. Bella’s fully recovered from her tooth drama, and has found John a comfy, warm place to look annoyed about being petted. Sherlock has, predictably, decided to experiment with Pod and a laser pointer (he also refuses to call Pod by anything other than his full name). 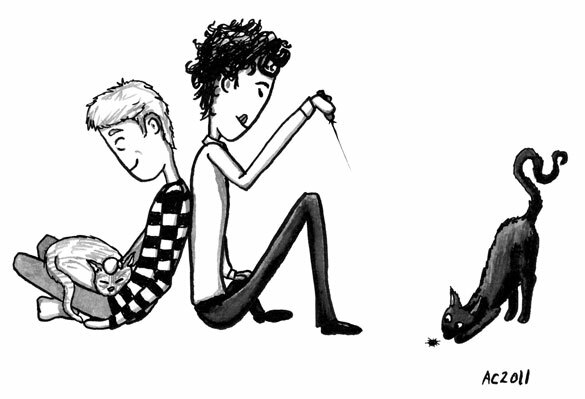 All in all it was fun do draw cartoon versions of my kitties, and of course I always enjoy John & Sherlock. Kitties Visit Baker St., 7″x5″ pen and ink on paper, not for sale, commission.